A smart approach to braille education, to learn Braille. 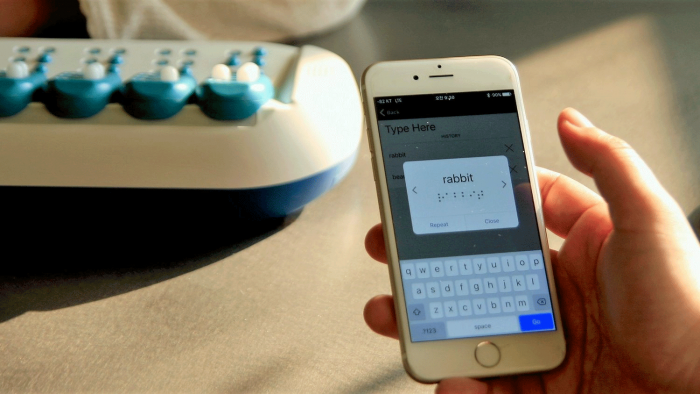 Taptilo is a wireless Braille device that syncs to your smartphone to help you learn Braille in a fast, easy and fun way. Equipped with the latest Braille cell technology, multiple teaching options, interactive audio instructions and various self-study games, Taptilo is the ultimate smart solution to Braille education. Now with Wi-Fi connection and upgraded software. Taptilo is an all-in-one Braille education solution that includes a combination of a hardware device with the latest Braille cell technology and an innovative application and software with improved user interface. With its interactive software and personalization features, as well as a growing library of available content for wireless download, Taptilo makes Braille education efficient, effective, and of course, fun! With the new Wi-Fi feature, Taptilo 2.0 becomes even more versatile. Easily download and install new educational content directly to your device with a few taps on your app. Keep your device up-to-date with the latest firmware upgrades and features. Enjoy access to the online library of content, wherever you are connected! There is nothing more important for an educator than keeping their students engaged and interested in class. 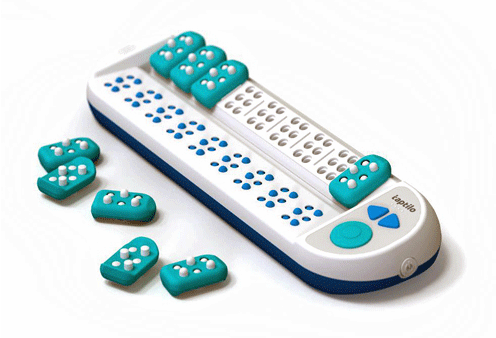 Taptilo makes Braille fun and interactive by incorporating learning by movement, touch and hearing. Type a word or a secret message from the app and watch Braille dots come alive under your students’ fingertips. 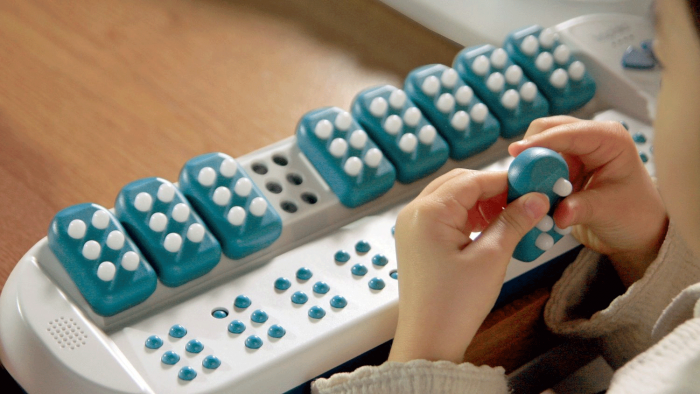 The jumbo-sized, child-friendly Braille blocks can be easily manipulated by young children and help strengthen and refine finger movement as they play. Children can easily follow along games and activities even on their own, thanks to the dynamic audio and tactile guidance. Easy to personalize your own content, upload and manage your own word list. Uncontracted and UEB available. Option to temporary switch word back and forth from uncontracted to UEB to practice at the same time. With self-study mode (without the app), students can play and learn independently with minimal adult supervision. 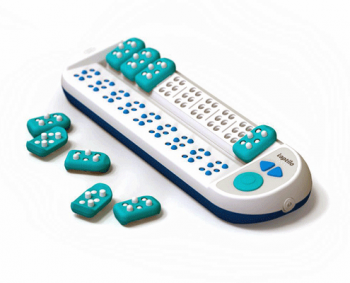 Innovative and engaging design that combines a refreshable Braille display to practice reading and a Braille writing pad with manipulative blocks to practice writing. Easily download and install new content and language packages in a few minutes. Manage your content on your app. Information from the blocks is transmitted and displayed on the Braille display and app screen, and vice versa. Taptilo can check the spelling for you. Large sizeBraille , about five times larger than standard Braille, provides improved tactile experience for young children to increase finger strength and agility. Large size Braille is also helpful for senior users with weakened tactile sensitivity. 9-cell jumbo Braille display and 9 manipulative Braille blocks which can cover the majority of pre-K, K-6 vocabulary. Designed ergonomically with the child in mind. Round shaped, no sharp edges, smooth matte texture, good grip, non-slip base. Individual pins on the blocks have appropriate pressure and gives a satisfying click when pushed until the end. Braille blocks can be held & placed in different directions; the writing sensor works when placed upright as well as upside-down. Safe for children to chew and play with, RoHS compliant.